Here are some help videos to get you started and answer any likely queries you might have when registering for a TPS screening account, screening your data or managing your results. Missing leading zeros on your phone numbers? The following four videos will guide you step-by-step through the process of signing up for a TPS Screening account, verifying your email address, uploading and screening a file and downloading your results. If you still need help, please contact support on 0843 005 9302 or one of our team on Live Chat. This video explains several ways to resolve the issue of leading zeros missing from your files when you open a Comma Separated Value (CSV) file like the ones we use to ship you back the results of your Telephone Preference Service (TPS) screening. This video walks you through how to screen a file that contains several columns of phone numbers against Telephone Preference Service (TPS / CTPS). This video explains what a Comma Separated Value (CSV) file is and how it differs from a standard Word or Excel file. We use Comma Separated Value (CSV) files to ship you back the results of your Telephone Preference Service (TPS) screening. 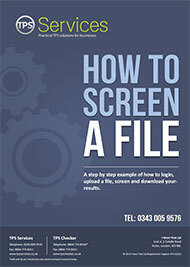 A step by step example of how to login, upload a file, screen and download your results.